CCTV that was reported to be taken from from the deadly Brussels Airport explosions, appears to be fake. 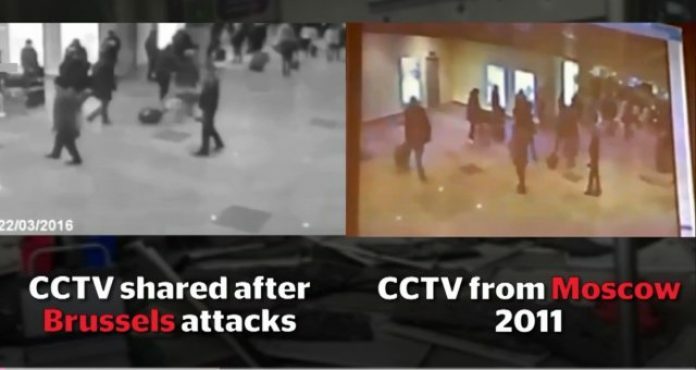 Footage that was said to show the Zaventem Airport explosion is remarkably similar a video that shows the moment a bomb attack took place at Domodedovo Airport in Russia in 2011. But as the Independent reports: the clip, which shows people walking before they duck and flee following an explosion, has been widely shared on social media since the Brussels blasts took place on Tuesday morning. And that wasn’t the only fake video that was put out yesterday…. During this massive search and presentation of information, some disinformation made its way out on the airwaves, as well as the interwebs. While claiming to have CCTV footage from Tuesday’s attacks in Brussels, CNN ran a clip of a chaotic scene of a smoke-filled subway tube with people running for their lives. Citing the non-existent Twitter handle, @OnlinMagazine as their source, CNN showed a looped video of people frantically attempting to escape a burning subway while Chris Cuomo pretended he was a reporter. No retraction has been made and, in fact, the video is still available for viewing on the media giant’s YouTube channel. In instances of attacks like this one, CCTV footage is always carefully reviewed before its release. The idea that it could have been released only hours after the attacks is ridiculous, which highlights, at best, the incompetence of such a large news organization, or, at worst, a deliberate release of false information meant to deceive their viewers. Either way, this is one more reason not to trust the mainstream media.